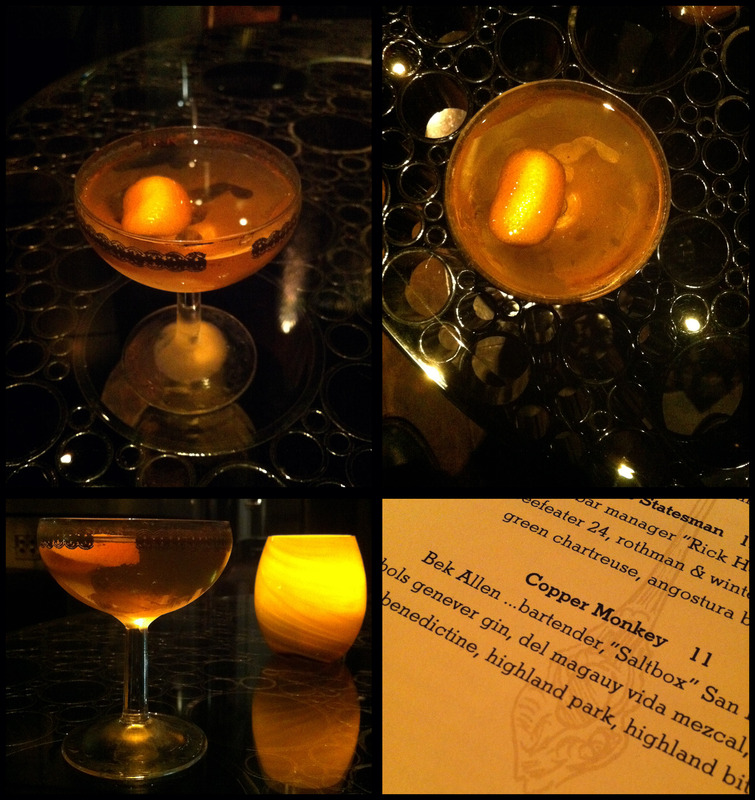 The magnificently named Copper Monkey is a creation of Bek Allen, in-house bartender at Saltbox and the other half of Erin Williams’ Hush Cocktails. On paper, it looks like it has the potential to be the most offensive drink ever made. It features not one but three distinct ingredients that are found revolting by a significant cross-section of Americans. The Bols Genever with its malt & agricole funkiness, the briny smoke of Islay scotch, and of course the Vida mezcal, with all its lovely notes of smoked gasoline. I’m crazy about scotch and mezcal and I tolerate genever, but even I wouldn’t imagine they would taste very good together. And I was, of course, wrong. I asked for the proportions, and was rebuffed. Rebuffed! Apparently they don’t do that, which is kind of lame. It’s against my professional philosophy to keep recipes secret, but I do more or less understand. Also, Bek herself wasn’t there, so perhaps I can grab it from her personally next time I see her, seeing as she invented it and all. For all of its bizarre and intimidating ingredients, the cocktail was surprisingly approachable. Faint genever and Bénédictine on the nose, and the first impression is strangely one of sweetness. It’s not a trivial amount of Bénédictine – probably 0.75 to 1oz – and the sweetness serves to make it complex instead of abrasive with a sweet, long finish. The scotch shows up on the finish, along with a hint of the mezcal. Honestly I expected to taste the mezcal a lot more, making me wonder if it’s just a rinse. The agricole from the Bols Genever forms the backbone of the drink, with some fresh orange notes from the bitters along with a whisper of cinnamon here and there (I assume from the “highland bitters,” which are new to me). The only sensation that really steps out from the crowd of ingredients is one of sweetness. Aside from that, it’s a terrifically balanced and inventive cocktail. While I’ve had this cocktail, and find it amazing, Ms. Allen did not create it. Her business partner Erin Williams was the creator of this cocktail and was more than happy to share the recipe with me. Unfortunately the last time I visited Saltbox, about 3 weeks ago, I asked for this cocktail and was told they no longer serve it. The cocktails were not what they were when my favorite hotel, Se’ became the Palomar. I was told Ms. Williams and their resident Chef Simon Dolinky had moved on and was disappointed with the quality of the food and drinks. Hopefully they step it up to what it was when they opened. Actually Brian Bek Allen did create this.I am sorry you were mis informed but please try not to assume anything. Yeah, while Erin certainly knew the recipe, I can confirm that it was Bek’s, for two reasons: (1) she gave me a version of it when she was workshopping it, and (2) she was given menu credit for it, as evidenced in the picture in the middle of the post. That was a great drink. Hope you’re doing well!